If you have a valid US, UK or Schengen Visa then we can apply Electronic Visa (also known as E-Visa) for you. Electronic Visa for Turkey confirmation can be received instantly or at times within 24 hours. 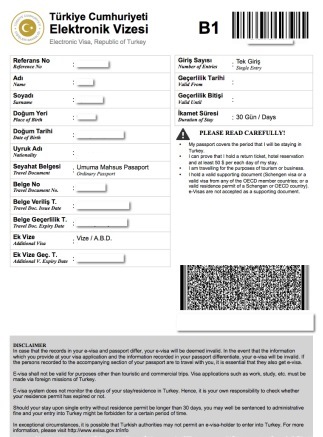 Attached is a sample of how E-Visa Turkey looks like. Below are Turkey Visa requirements in case you don’t have a valid US, UK or Schengen Visa. 17. The Embassy of the Turkey reserves the right to request additional documents if needed. Note: Visa acceptance and rejection depends on Embassy/Consulate from case to case. For more, mail us or call us at +92-21-37248155.